DC Comics | Goblins, Swords, Elves, Oh My! When I was a kid, I’d always dreamed of a Justice League film. Reading the JL comics, watching Superfriends reruns and the Bruce Timm Justice League series only added fuel to the fire for my dreams. For a while, I was convinced it wouldn’t happen anytime soon, and if it did I’d either be dead or too old to care. In 2007, there had been rumors of a Justice League film in development with George Miller (Mad Max) at the helm. But when those developments didn’t come to fruition, I was back to dreaming. Then, 5 years later, Marvel released The Avengers. I remember sitting in the theatre, in awe at seeing characters I’d read in comics or watched on Saturday mornings, fight aliens in New York. Then as a response, DC announced Man of Steel to be released the next year. That ignited the fuel… And now in 2018, and four DC films later—Justice League! To tell you the truth, I wasn’t sure how good Justice League would be. (Or if it would even be watchable.) 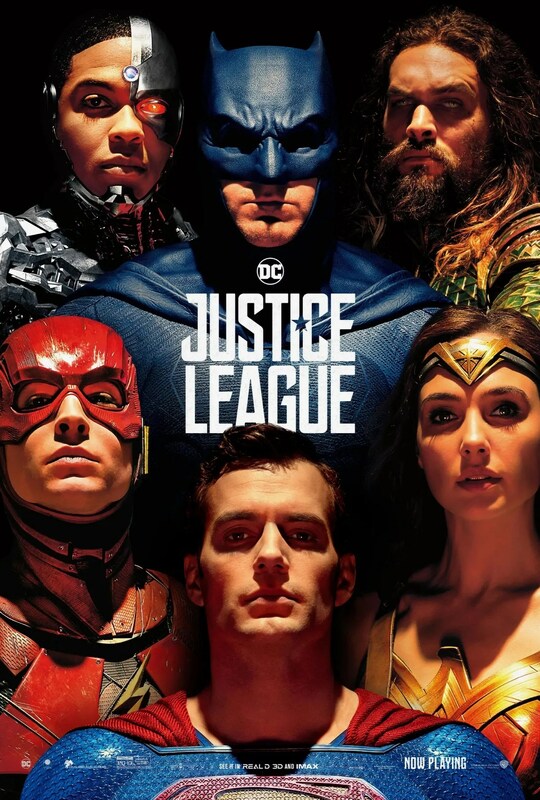 Man of Steel was good, Batman v. Superman wasn’t horrible or good, Suicide Squad was unbearable, and Wonder Woman was the best one out of all of them… I was hoping Justice League would get better reviews from critics, but seeing the reviews the film sounded like a mess worse than Suicide Squad. Anyway let’s start with the directors. Zach Snyder (Watchmen, BvS) was originally attached as the director, but then tragedy struck and he had to stop. Thus Joss Whedon (Avengers, Firefly) was brought on to finish, and he made some script changes, and filmed some additional scenes. If you see this movie, see it for the acting. Specifically from our six heroes: Henry Cavill, Ben Affleck, Gal Gadot, Ray Fisher, Jason Momoa, and Ezra Miller. (Honorable mentions include Jeremy Irons as Alfred, and J.K Simmons as GPD Commissioner Gordon.) All six seem to have good chemistry, and that’s always integral for team movies. Out of the six, Fisher, Momoa and Miller steal the spotlight. (Cyborg, Aquaman, and Flash respectively.) League is a great film debut for those three. Though I feel bad that Ciaran Hinds didn’t get to play a villain with good lines. Overall I give Justice League 3 1/2 Stars out of 5. No it’s not perfect, but League is fun to watch for some super heroics! Also don’t forget to watch the after credit scenes. I know I haven’t reviewed comic books on this blog, but I thought it would be smart to add them. Lately, I haven’t really been reading much novels. And I happen to subscribe to quite a few Marvel, DC, and Independent comics. So it seemed like a good idea to add comic reviews rather than let this blog get lost in the web. I won’t be reviewing every single issue though. I need more time for writing fiction, editing, etcetera. So I’ll be reviewing certain issues and graphic novels I really enjoyed. Like this issue; Detective Comics #27. Back in 1939, Batman first debuted in Detective Comics #27. That issue is worth millions of dollars, and is very rare… Unfortunately, this review is not for that original issue, but rather a retread. DC controversially rebooted all their books in 2011 and renumbered all of the books as #1, as part of The New 52 initiative. A little confusing I know, but in the modern comic’s industry renumbering has become common, and not too special. You can find or order this comic at your local comic book shop. To celebrate 75 years of the Bat, DC decided to make #27 a special over-sized issue with Batman stories that paid tribute to Bill Finger & Bob Kane’s popular creation. This 100 page comic has some amazing new stories, written by people such as Scott Snyder (Current writer of BATMAN and THE WAKE.) , Peter Tomasi (BATMAN & ROBIN), John Layman (DETECTIVE COMICS) , crime fiction and comics writer Gregg Hurwitz (Batman: The Dark Knight) and surprisingly the bestselling thriller novelist and host of Decoded, Brad Meltzer (And he wrote the popular DC miniseries IDENTITY CRISIS.). It also has fantastic art by Francesco Francavilla (Afterlife with Archie) , Bryan Hitch (THE ULTIMATES), Sean Murphy (Punk Rock Jesus), Jock (Savage Wolverine) and many other amazing artists. Overall I’d give the comic 4 out of 5 stars! This $7.99 over-sized issue is well worth the purchase, especially if you’re a long-time Batman fan, or want to be introduced to the books. Also, it stays true to Bill Finger & Bob Kane’s vision for the character, and has all the qualities that has made Batman relevant for 75 years, and very likely beyond that.